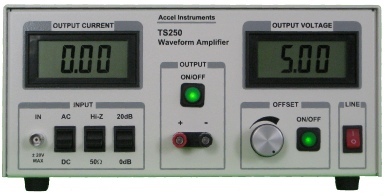 The TS200 Modulated Power Supply is a unique equipment for many lab test and measurement applications. It combines a four-quadrant power supply and a high-current power amplifier. The TS200 is great for measuring application include battery simulator, LDO PSRR measurement, piezo driver, signal generator amplifier, lab power amplifier, transient response test, and more.